ADDITIONALLY: To read a long excerpt from Jaffé’s editorial, go here. And to read the Los Angeles Times‘s jaw-dropping report, go here. PREVIOUSLY: How to pronounce Jaffé. 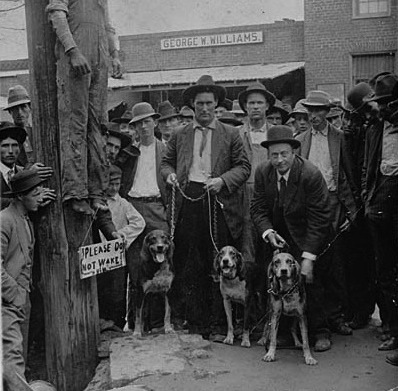 IMAGE: Lawrenceville Lynching (1911). Lawrenceville, Georgia, April 7, 1911. Lynching of Charlie Hale, a black man, on the courthouse square at the corner of Perry and Pike Streets. I’ve cropped the photo; to see the full image, click here. God knows the names of all those who carried out this horrid act.They will be judged by God and given their just do. You, can count on it. All hate mongerscin America; be aware. God is watching you. You shall reap your reward.